Amazon Assistant is a service by Amazon that is offered as a browser extension or mobile application designed to improve the Internet shopping experience. Its main features are product comparison, access to Amazon's wishlist from any website, the highlighting of daily deals on Amazon, and a search. Amazon Assistant is a controversial product. First, it replaces the much simpler Amazon Wishlist browser extension which concentrated solely on adding products to the wishlist but shipped without other features and was not nearly as invasive to privacy as the product. What may weight more is that it is bundled with Java meaning that it may land on a user's computer unexpectedly. 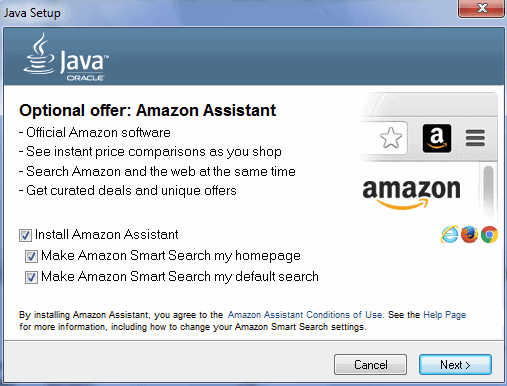 The Java offer will not only install Amazon Assistant by default, it will also change the homepage and default search to Amazon Smart Search. If you read the conditions of use of Amazon Assistant on the Amazon website, you will immediately realize that the service monitors what you do even if you are not using it or interacting with Amazon services. The Amazon Assistant may also collect information about the websites you view when you are not interacting with the Amazon Assistant, but we do not associate that information with your Amazon account or identify it with you except as required by law. Examples of the information we collect and analyze include a subset of your IP address; a domain name or full URL of the Web page you are visiting and any referring URL’s to the visited web page; general information about the visited web page, such as product search query or specifications; general information about your browser; general information about your computer's operating system; other identifying alphanumerical information enabling Amazon to identify your computer; and the date and time the above information is logged. Amazon won't link the information it collects while you are using the browser or application with the Amazon account directly, but it will associated the information with the computer by using identifying information. Amazon may make information available to third-party applications or services, and information that is collected may be sent to these services and applications. If you break it down: Amazon Assistant records your Internet history while it is installed and will provide Amazon with the information. While Amazon won't associate the information with your Amazon account directly, it collects information that provides the company with enough information to identify the computer used. Furthermore, it would be trivial to link use of the extension or app to an Amazon account, if users sign-in to their Amazon account while using the application. One way around this would be to use a browser profile or separate browser exclusively for use with the browser extension. In the end, it comes down to weighting the positive and negative impact of Amazon Assistant on your life. Now You: Are you running privacy invasive apps or browser extensions? Amazon Assistant is a browser extension and application designed to improve the shopping experience but highly problematic from a privacy point of view. Are you running privacy invasive apps? Yes unfortunately, the most privacy invasive of all: Windows 10. Is there any particular reason you’re specifically singling out Windows 10, but completely ignoring Google and Apple? Allow me, as I see this many times posted. Tim, I think there are many people like me, who treat their desktop/laptop as a more private device than their phones (I assume you mean Nexus/iPhone by Google/Apple). My phone’s storage is just.. temporary storage, at best. Every backup feature is disabled/removed, and as soon as I connect it to my PC I transfer all the new media from it. There’s nothing important on it, at all. Compared to my PC where I have all my pictures/videos, etc. The tracking problem (via its GPS, which is impressively accurate, phones came a long way in the past few years) – I also don’t care. Google, at best, will associate that the owner of this device (in my case they also know my name, age and country, info that I gave away, my choice not to keep it private) with the frequented places – well, lets see, a pharmacy, where I work, couple of restaurants/bars where I have a drink every now and then and maybe where I do my groceries. That is not valuable private info for me. They can have that, and for all I care everyone could. tl;dr – my PC is My Computer, running Windows 7, with no telemetry and background transfer services; not as micro$oft is subtly hinting in the later iterations of their OS with ‘This PC’ (; My phone doesn’t contain any valuable private info. And why would it? I always have it with me, I could easily lose it, I could forget it at a bench in a park, at a local, at the beach, etc.. been there, done that – not wotrh it. This is why I think people care when Microsoft is doing it, and couldn’t give a darn when/if others are doing it. @Tim, Could it be because “someone” doesn’t use Google and Apple products? You know how sometimes in dystopian Sci-Fi movies they have a Bruce Willis type main character who is “unplugged” and lives the old school way of life. Yeah, I kinda feel like doing that with the way the Internet and technology is currently going. I might be halfway there — almost never answer my phone (my phone is for me to make calls, not for people to hassle me), have no social media presence, and am “awful with emails.” When Amazon (which already knows my shopping habits better than I do) recommended their Assistant, my first inclination was to understand how the browser add-on interacts with my browsing history (hence my being here). Me, I don’t use Amazon except as an info source. No FB or Twitter accounts.I don’t bank online or pay bills online. i have no smart devices.Trying to fly under the radar. Yes, I run browser extensions and apps. I also run FF which is like any other browser privacy invasive. The question should have been – is there anything out there that is not privacy invasive ? And why do developers invest so much time and effort creating apps and extensions for free use ? Samaritans in our cutthroat society ? Obviously. Don’t you think developets create free app and hope for little money from donation? It is obvious. Don’t you think developers create free app and hope for a little money from donation? Yes, agreed. But all of them ??? I have really been focusing a lot lately on privacy. I have gone through a lot of privacy adjustments in Firefox. I’ve disabled 3rd party cookies, and FF dumps my cache on exit. I’ve added extensions HTTPS Everywhere, Disconnect, and Self-Destructing Cookies (SDC). I use Ublock Origin, and I recently signed up for PIA VPN. I have no Facebook or Twitter account or any other social media for that matter. I’m not a nutter or a tin-foil hat conspiracy nut. I just feel like no one who reads tech news daily can deny that spying, tracking, targeting, etc has gotten out of control in the last few years. Facebook is tracking users who don’t even have FB accounts, it’s nuts. I do still use Google search, but I disabled search history in my Google account. I’m not under the delusion that I’m still not being logged, and I do more personal searches (e.g. health issues) via Duck Duck Go. you should also consider adding Random Agent Spoofer and Privacy Badger to your addon arsenal for disrupting browser fingerprinting. If you’re an advanced user, get RequestPolicy Continued to block scripts. Java is downloaded…. this is an useless application. Simple suggestion ban oracle sites. The answer to this question is: “I hope not.”. I do not believe that I use privacy invasive browser extensions. I typically do not Chromium based web browsers. 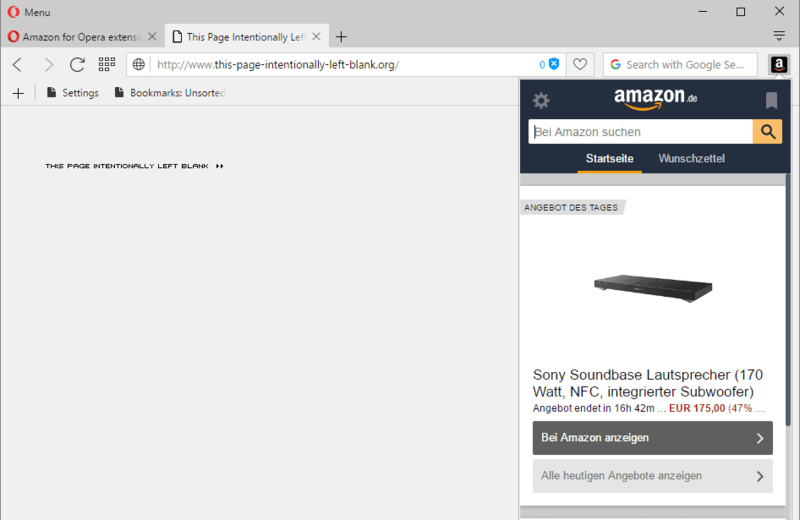 I examine the extensions intended for Firefox and Firefox-based browsers to determine if the extension should behave as expected. I do not use extension that I find to be against my interests (which does include monitoring my activities). With regards to “apps” (interpreted to mean software programs that are for Android, iOS, or a Windows App framework), I try not to use privacy invasive apps. I do not use iOS. The apps for Windows 8+ are treated as any other software, but with the App framework (I think) dependency. I very seldom find myself in a situation where I am using Windows 8 or its family or newer Windows family operating systems. With regards to Android apps, I do examine what I can about the apps, I perform an (Kaspersky brand) Antivirus scan on it, examine its permissions, given that information and my understanding of the potential value provided by app, I may make a determination whether to install the app. After installation of the app, and prior to running it, I examine the app for select intrusiveness using the app tool “Lucky Patcher” ( http://lucky-patcher.netbew.com/ ) and try to patch the app to remove the ads, design defect, or other issue. There are complications and shortcomings to this methodology. First I doubt that the Android software may be well examined by the Antivirus vendors, and I have noticed that adware is not flagged by the Kaspersky Android antivirus, nor are various privacy intrusive apps (modern antivirus software scans for more than just viruses). It is often unclear as to what whether select permissions are reasonable for apps. The Android app market currently (unfortunately) is flooded with adware and spyware. For system apps or apps distributed with or as a part of the Android operating system, I rely on findings from others regarding malicious apps (oftentimes these are included with Android distributions such as from mobile cellular operators, presumably for their and government monitoring of the user). The greatest shortcoming, however, comes from the lack of understanding of how the apps run on the various distributions and versions of the Android operating systems. For example, it may not be clear when an app may be running (such as when it is operating as a background process), or to what extent it can or has integrated with the operating system. Given my current much doubt with regards to my information on Android devices, I make rather limited use of them. It is a shame; I would really like to be able to avail myself of much of the value provided via its (Android and the apps), but I am unwilling to given the great potential of the technology being used against me.